Transportation is a key ingredient in the recipe for success for any developing city. During the 19th century, the railroad was king of transportation. Without direct connection to the increasing complex railroad network, the expansion and development of a city was severely curtailed. With this knowledge in hand, local promoters and businessmen were motivated to connect San José to the developing railroad network. The most important link was the first one that connected San José to San Francisco in 1864, preceding the transcontinental railroad by five years. This provided San José with an international seaport to export their agricultural and industrial products. After an additional rail line was connected to Sacramento in 1869, the San José community had a direct rail line via the newly built transcontinental railroad, to the east coast. To local producers, these lines provided swift, reliable transportation for their goods to both eastern markets, and via ship, to those overseas. In return, the rail routes made transport of materials, such as coal, iron, and oil into the Santa Clara Valley much cheaper. These factors combined to further the rapid growth of San José’s population. San José became a thriving food processing, packaging, and transshipment center. The proximity of the area to the fertile valley lands and fruit orchards, and to the diverse employment population of San José and Santa Clara, made the area a natural location for canneries, warehouses, cold storage facilities, and related industrial uses. The Santa Clara Valley became the world’s largest food processing region between 1920 and 1960. Since the 1950s, the canning and trans-shipment role of the area has declined in importance. The urbanization of the surrounding orchard lands and the emergence of interstate trucking as the predominant mode of transportation made the area less competitive with the Central Valley and other agricultural regions. Over the last 30 years, all of the canning facilities have closed their doors, including the former Beechnut factory located directly across Senter Road from this display. Built in 1913 by the Baldwin Locomotive Works in Philadelphia, PA, this 75-ton locomotive is typical of the switch engines required to support the numerous food processing industries which once dominated the Santa Clara Valley landscape and economy. Switch engines have no leading or trailing trucks enabling the locomotives to make sharp turns onto side tracks and spurs common with industrial trackage. After these engines moved railcars to a centralized yard, larger locomotives were utilized for moving longer trains over mountain passes and broad distances. 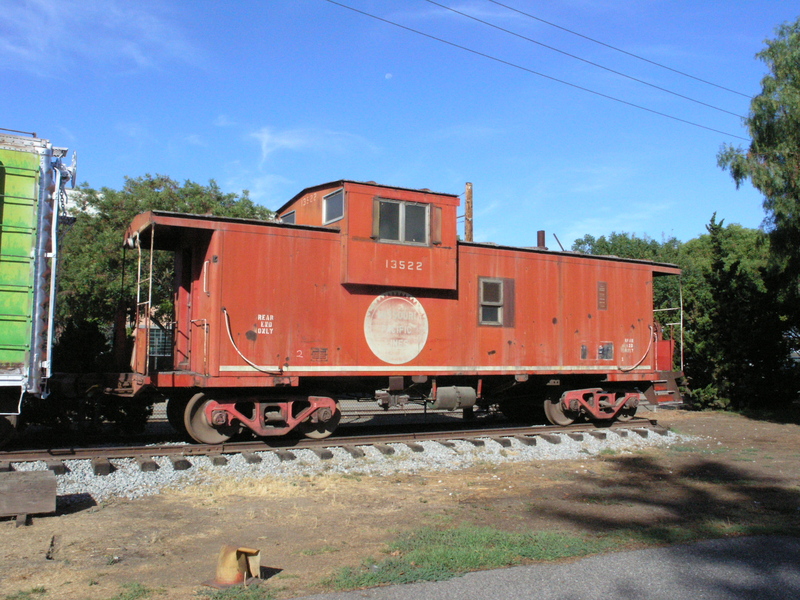 For over a century, cabooses were a familiar sight at the end of trains. Essentially a traveling office, these vehicles provided space to complete shipping paperwork related to the movement of freight over railroads. The cupola portion of the caboose allowed crew members to prevent derailment by watching for defects on the train and shifting of the freight. Advancements in railroad and computer technology replaced manual observation and paperwork, decreasing the need for cabooses. Today, trains ends are marked with a flashing red light device. 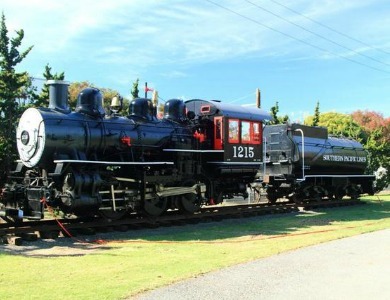 On January 14, 2013, a wide cupola style Missouri Pacific railroad caboose (#13522) was coupled to the existing Southern Pacific Railroad steam locomotive at History Park. Both the locomotive and caboose are owned by HSJ affiliate organization, the California Trolley and Railroad Corporation. 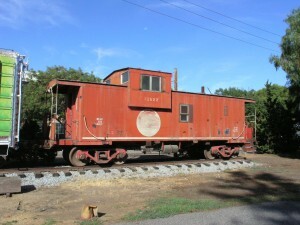 After its retirement from the railroad, and prior to its CTRC ownership, this caboose was used as a private office for a distributor on Park Avenue in San José before being stored for several years in Salinas. Funding for the relocation was generously provided by the Rotary Club of San José Foundation. Railroad cars are built for specific transportation requirements. For instance, liquid or gas products require tank cars, and long commodities, such as pipe or steel, may require flatcars. Because of the protection offered to transported goods, the boxcar became the most common railroad vehicle. The 40-foot steel boxcar was the standard size for railroads for many decades and was the backbone of the railroad’s home front effort during World War II. The majority of railroad traffic to and from Santa Clara Valley’s canneries traveled in this type of freight car. Following the war, these cars began to be replaced by larger and longer boxcars, and now approximately 200 40-foot steel boxcars remain across the United States, mostly in museum environments. In the early 1960s, the City of San José denied Al Smith permission to install a sign along Auzerais Street to promote his Orchard Supply Hardware store because a sign for the store already existed facing San Carlos Street. 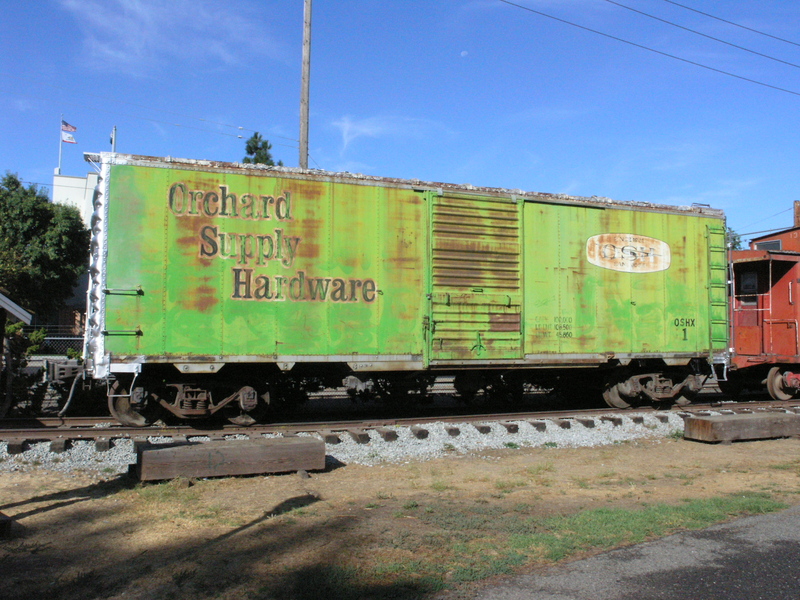 Undeterred, Smith bought this boxcar from Southern Pacific, painted the car with the OSH logo, and placed it at the end of the spur track behind his store and alongside Auzerais Street. It remained in that spot for nearly 50 years, and was occasionally featured in OSH’s promotional material. Because of its long-term private ownership, the boxcar still closely resembles its “as-built” condition. 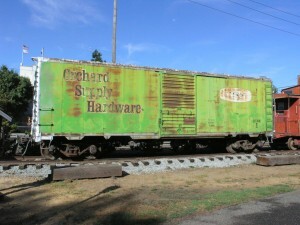 Recognizing its historic relationship to the San José community, OSH donated the boxcar to the California Trolley and Railroad Corporation in 2013 for display in a museum setting. The locomotive, caboose and boxcar are currently owned by the California Trolley and Railroad Corporation.